Police are on scene of a shooting at the 15700 block of 100th Avenue in Surrey. Approximately 9:10 PM two cars were speeding down 100th Avenue shooting at each other - a Dodge SUV and a Honda Civic. Both vehicle crashed at the scene. The driver of the Honda was wearing gloves and tried to flee the scene but a group of locals pinned him to the ground and held him until the cops came. Give it up for Surrey yo. I saw one victim taken away on stretcher by ambulance. There are a ton of cop cars, ambulances and fire trucks on scene. Update: News 1130 is reporting that "Several arrests have been made and two men are in the hospital with serious injuries after a series of events in Surrey on Monday night that involved a shooting and a major multi-car crash. 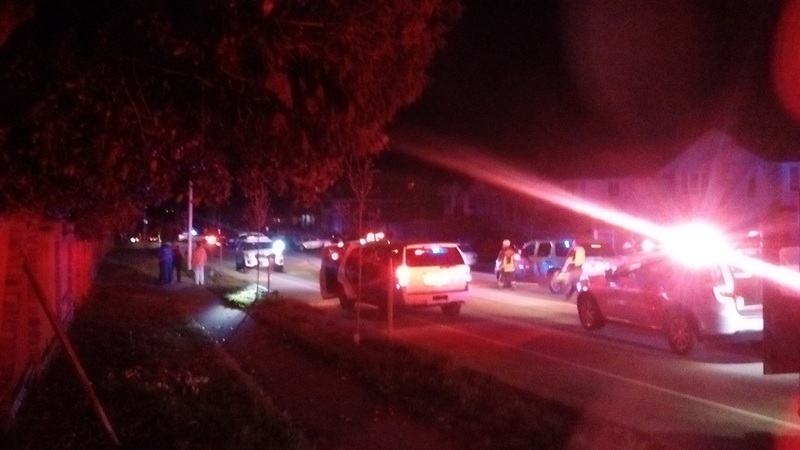 Surrey RCMP initially responded to reports of shots being fired in the 153rd block of 102A Avenue at approximately 9 p.m., injuring a man who was found nearby a short time later at 100th Ave near 159A Street at the scene of a multi-vehicle crash. Also found at that second scene was another man with serious injuries sustained in the crash, which has also resulted in one vehicle being embedded into a home." This confirms previous reports that there was also a large police presence outside the Taphouse. Update. Bustin caps in my crib yo. Yes I heard the shots. CTV has a video of the report as does Global. The Peace arch News has some pictures and even Castanet picked up on the story. Police say it was a targeted shooting related to the ongoing gang conflict. So what does that really mean? Two cars full of brown kids shooting at each other. Follow the rich white man. One group wants to sell for the Hells Angels, the other group doesn't. It's that simple. People in my neighborhood buy weed from the Hells Angels. That's none of my business. As I've said before, pot is legal. The UN and the Hells Angels have just as much right to sell pot as the cops do. The Hells Angels killed a kid just over in Fraser heights because he was selling cocaine in their area. That's none of my business either. If you are going to sell cocaine, you take that risk. However, these punk a*s b*tches shooting up my crib, that's my business. Before Blaze went into the Witness Protection Program he was bragging about how he knows all the drug dealers in Guildford. How did he know them? Turns out he was supplying them on behalf of the Red and White. So don't sluff this off and say it's just more brown guys shooting each other. We need to open our eyes and be honest about what's really going on here. The real problem is that the police simply don't care. They're too busy running around putting fingers in the dike that they refuse to look at the big picture. They rather treat the symptom then the cause. David Eby is useless. He has bought into the RCMP's misguided mandate. They have no desire to disrupt drug trafficking. They just want to help the Hells Angels obtain and maintain a monopoly on the drug trade so they can tax them by seizing the proceeds of crime. That is not law enforcement. Since the RCMP refuse to address organized crime, we need to hire someone else who will. Doug McCallum has submitted an effective action plan on creating a municipal police force just like every other mayor city in Canada and the BC NDP are throwing up roadblocks to stall the transformation as long as they can. Right now the BC NDP are part of the problem they are not part of the solution. It's clearly time to replace them too. two vehicles with young people in them shooting at each other. In my opinion, the franchise model is not working. Only young and dumb people go at it in this fashion to settle a dispute. It was reckless and self absorbing. if they want to kill themselves and/or each other, that is their decision, but to use the roads in this manner is simply not acceptable. It truly is about time something was done about this behaviour. Now it maybe these young people have mental health problems, were high on drugs, but they need to stop engaging in this violence. Others could be killed. Others have been killed. Dennis has a list. yes, I'm aware of that trailrunner78.